Backpacking insurance for those travelling with friends. Compare policies which offer discounts for companions or small groups of backpackers. You will all have the same policy numbers and assistance phone numbers. So everyone in the party has the same information. If an emergency arises it makes it quicker to get help. The list of permitted potentially hazardous activities is the same for everyone in the group. 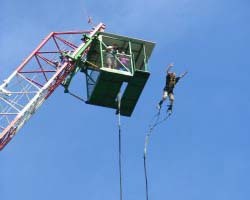 This means that, if you decide on a spot of bungee jumping, you are all covered or all not covered - so less chance of one person having to sit out on the fun. And if you want to get extra cover it's one phone call to your insurer - not a series of calls from the other side of the world. If any of you have an existing medical condition it is a good idea to insure the whole party on the same travel insurance policy. If the person with a medical condition needs to claim, never mind the reason, then the rest of the group are also covered. An example of this would be if one person is taken ill abroad then the policy will enable another person in the travelling party to remain in the country with them until they are well enough to travel again. If, in the worst case scenario, the holiday needs to be cancelled because of a medical problem which was related to the pre existing medical condition then all those travelling and insured on the same policy should be eligible for a refund. But whilst most insurers offer family or partner's discounts most of these only apply if you are officially 'a couple'. We have detailed policies below who buck the trend, and show the discounts that apply if you insure together (if you are in a relationship they apply for you as well!). Sign up for the free Flexicover newsletter before buying your policy and you'll receive a voucher code saving 10%. Travel Companions buying a policy together both save 5%. Maximum Trip periods are reduced for those over 65. Policy compared is the Platinum cover. Sign up for the free Flexicover newsletter before buying your policy and you'll receive a voucher code saving 10%. Travel Companions buying a policy together both save 5%. Platinum cover compared. Product compared is the Gold Gap Year policy available through our link - Top Dog also sell less comprehensive policies via other comparison sites. We have also detailed a few hazardous pursuits (such as bungee jumping, white water rafting (level 1/2), scuba diving to 30m (accompanied and subject to qualification) and undertaking an organised safari so you can get a feel as to their appetite for these as well.